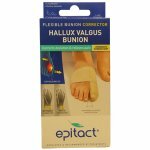 Carnation bunion pads are ideal for relieving pressure from painful bunions. Only medical grade chiropody felt is used and adhesive is hypoallergenic, thus suitable for sensitive skin. Relief is best achieved by placing the centre hole of the pad over the centre of the bunion. Diabetics should seek medical advice before using any type of foot care product.